In the late 1880s, Penn’s medical faculty consisted of twenty-three professors, including six clinical professors and four emeritus professors. This distinguished faculty included some of the most respected physicians of the nineteenth century – men such as D. Hayes Agnew, Richard A.F. 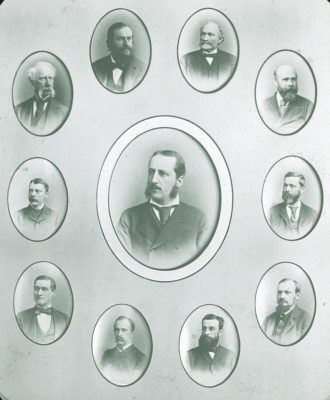 Penrose, William Pepper, Jr., Alfred Stillé, James Tyson, J. William White, Horatio C. Wood, Joseph Leidy, and such a rising star as William Osler. In the 1888-1889 academic year, these professors were assisted by 3 assistant and auxiliary professors, 48 lecturers and demonstrators and 14 students serving as laboratory assistants. At the University of Pennsylvania Hospital, students worked with the 25 staff physicians and 36 dispensary physicians; these included not just the teaching and clinical faculty of the Medical School, but other physicians as well. By comparison, the 169 students graduating in 1860, almost thirty years earlier, had been taught by just seven professors and three demonstrator/lecturers, with only one emeritus professor and, since the Hospital of the University of Pennsylvania did not yet exist, no hospital staff. A small part of the huge increase in teaching staff by the late 1880s was because the course of study had been expanded from two to three years, but more of this increase was due to the new emphasis on a broader curriculum and much more hands-on experience. Assistant and auxiliary professors, lecturers and demonstrators in the Medical Department as well as staff physicians at University of Pennsylvania Hospital are identified in the University Catalog for 1888-1889. Professors in the teaching and clinical faculties who taught during the student years of the Class of 1889, as well as emeritus professors, are listed below, followed by their life dates, Penn degrees and Penn faculty positions.